Today's guest blog is by paper artist Candy Wooding of www.mypaperarts.com. As a calligrapher, book binder and lover of all things paper, Candy has been playing with paper for as long as she can remember. 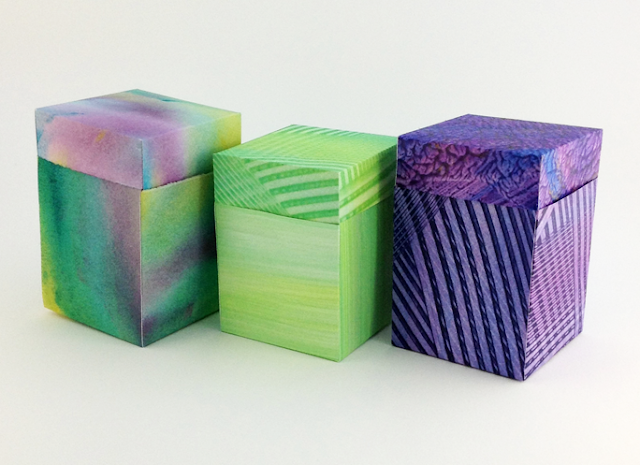 These 2-toned boxes were made from hand painted paste papers and hand colored watercolor paper. I've really enjoyed playing with these easy to make 2-tone boxes. When I was asked to be a guest blogger here, I decided I wanted to share something that's fun for me, but that other people could have fun with, too. When I looked at my books and boxes and papers on the shelf, I realized that these boxes were perfect. 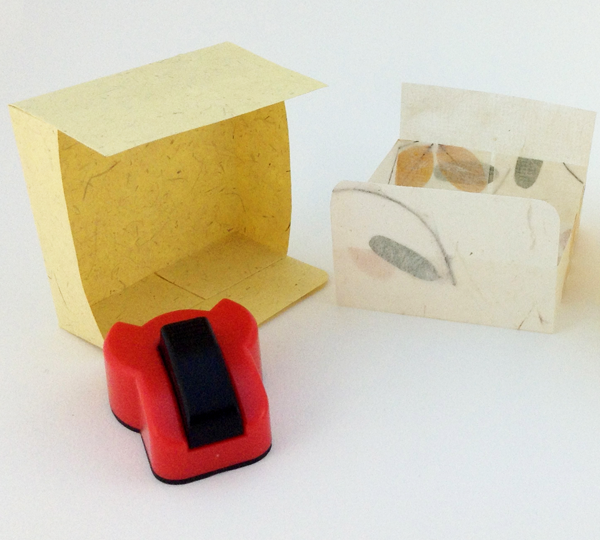 So far, I've made these little boxes with my paste papers, papers I've digitally designed and printed printed (such as my autumn leaves box below), card stock, watercolor paper and scrapbooking paper. I wouldn't recommend using tissue paper, though. 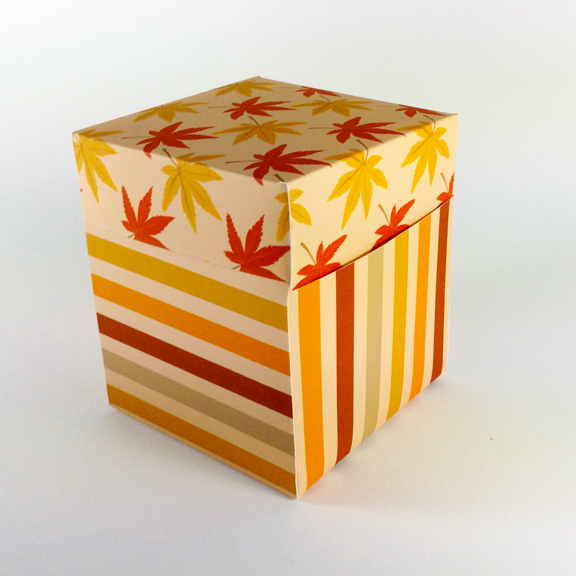 In Adobe Illustrator, I designed an autumn color striped paper and a leaf pattern and printed them out to make this little box. If you don't feel up to designing a paper on the computer, you can draw, paint, stamp, collage or stencil the paper, then use it to make your box. This is a fun project for children, teens, and adults. Since you can use almost any paper, it’s easy to decorate it for any holiday or event. If you need an excuse to make them, they'd make great as favors for a birthday, shower or wedding. Or even just because. This shows the top and bottom of a box and the flaps on each that get tucked inside the other half when the box is closed. The red tool is a punch that rounds corners. Notice that some of the corners have been rounded and some have not. 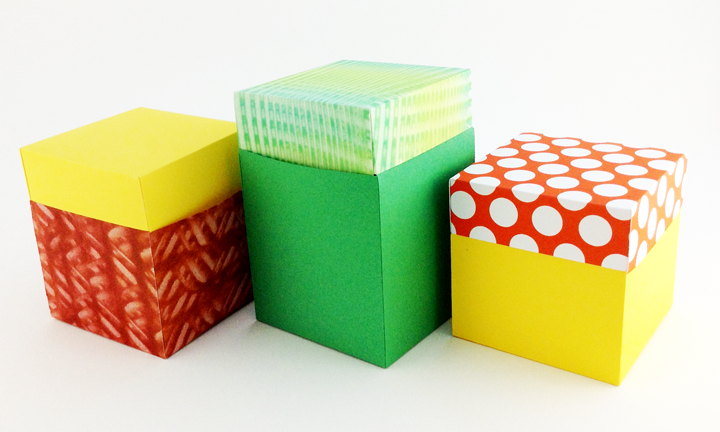 I used a corner rounder (shown above) to make rounded corners on my boxes. It's not necessary, but it does make a much more durable box over the long run. Another option would be to cut the corners diagonally to remove the point (which is the weak spot of any piece of paper that sticks up like that). The bottom and top can be made exactly the same. The long sides of one part tuck into the short sides of the other part of the box. If you want a more "traditional" box with a smaller top and larger bottom, you can adjust the height of the boxes. I chose to make my boxes with the bottom of the box taller than the top of the box. I made the flaps (the pieces that tuck inside the other half) 1” longer than the side of the box. This works with any size as long as the sides are at least 1" long. 2-toned boxes made with card stock, hand painted paste paper and computer printed paper. Click here for a downloadable pdf template of the box, top and bottom. I encourage you to play around and maybe even adjust the measurements once you're comfortable with it. This is a very versatile box with lots of possible variations. So artistic! I have been wanting to make paste papers for a while now. These are beautiful!